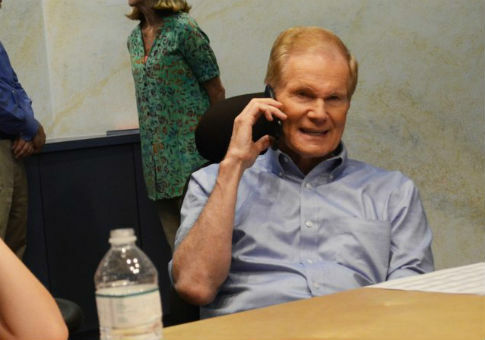 Florida Democratic officials intentionally sent false information to voters in a last-minute attempt to drive up the number of absentee ballots for Sen. Bill Nelson (D.) in his tight race for reelection. USA Today’s Florida network obtained an email showing Florida Democrats engaged in a statewide effort "to give voters the altered forms to fix improper absentee ballots after the Nov. 5 deadline." Those altered forms gave voters a false deadline to send in their absentee ballots, in the hopes a judge would allow those ballots to be counted. The Florida Department of State forwarded the altered forms to federal prosecutors, and the use of a false date on the forms appears to qualify under federal law’s definition of voter fraud. "Democratic party leaders provided staffers with copies of a form, known as a ‘cure affidavit,’ that had been modified to include an inaccurate Nov. 8 deadline," USA Today Florida’s Naples Daily News reported. "One Palm Beach Democrat said in an interview the idea was to have voters fix and submit as many absentee ballots as possible with the altered forms in hopes of later including them in vote totals if a judge ruled such ballots were allowed." U.S. Chief Judge Mark Walker on Thursday ruled voters can correct signatures on ballots until Saturday, which may allow the ballots returned with those altered forms to count in the election. Republicans appealed the ruling, supporting Gov. Rick Scott’s bid to keep the victory he’d apparently won on Election Day. Jennifer Kim, the Democratic Party's central Florida deputy field director, emailed step-by-step instructions for staffers to use the altered forms, in English and Spanish, to pull in as many voters as they could after the deadline. Meanwhile, Democratic Party Chair Terrie Rizzo was saying to follow the law and focus on provisional ballots, not absentee ballots, when it comes to fixing signatures. Kim’s email shows she wanted to go after those who voted by mail. The altered form Kim attached to her email had modified the state’s original document by falsely extending the deadline by three days, to Nov. 8. This comes after Palm Beach County Democrat Pam Keith deleted a tweet she sent telling people to submit forms to fix absentee ballots days after the state's deadline had passed. She admitted she was telling them to submit the forms after the deadline in the hopes the courts would rule in Democrats’ favor. Keith told the USA TODAY NETWORK-Florida that she was aware the deadline to submit those forms had expired even though she was telling them there was still time to fix their absentee ballots. She then directed people to email Katharine Priegues, a field organizer with the Florida Democratic Party, with the subject line "I want to help" for instructions on what to do. Keith insisted what she did is not fraud. After a judge ruled in their favor, she said what she did was right because the deadline was "arbitrary" anyway. "The deadline wasn't ‘wrong,' per se. It was functionally meaningless and arbitrary," Keith said. "Most people never get notice, and many ballots weren't even looked at until the deadline had passed." The Florida Department of State expressed concern and said making changes to state forms is a crime in Florida. "Making or using an altered form is a criminal offense under Florida law," said State Department lawyer Bradley McVay in reference to altered forms in Broward and other counties, which Florida officials forwarded to federal prosecutors. "More fundamentally, altering a form in a manner that provides the incorrect date for a voter to cure a defect (or an incorrect method as it related to provisional ballots) imposes a burden on the voter significant enough to frustrate the voter’s ability to vote."